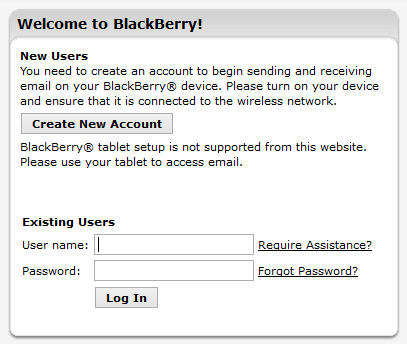 Blackberry Internet Service (BIS) allows users to synchronize the inbox of their mailbox with their Blackberry device. This service does not require an enterprise level data plan. Replace the bolded section above in the URL with the primary domain that is used to sign into the Office 365 services. If yours is not listed here, search for the provider followed by BIS in a search engine or contact your wireless provider. They should be able to provide the correct BIS URL as well as the credentials needed to login to the interface. (Note: Some wireless providers require the setup to be completed from the phone, not a computer web browser.) 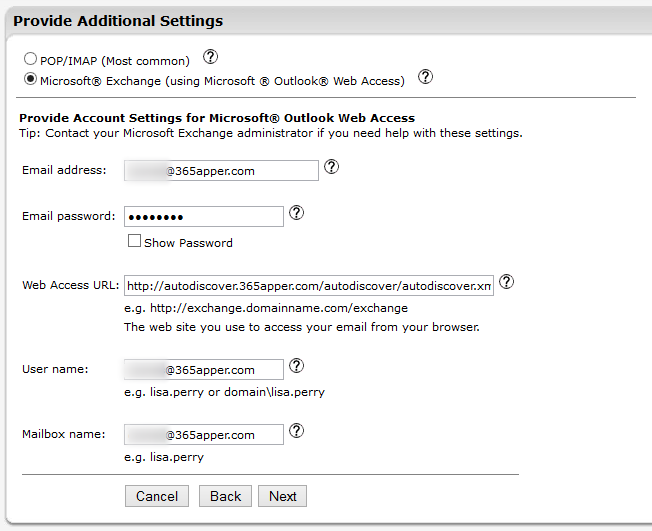 Please note that to login to this interface the Office 365 login credentials will not be used. The credentials for the BIS interface are completely separate; if the credentials are not known, please obtain them from the wireless provider. Once logged into the BIS interface, continue to the next step. 3. 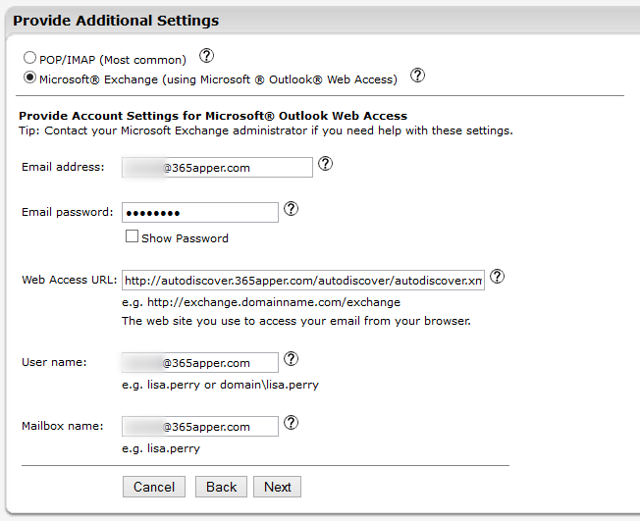 If not automatically prompted, click the appropriate button on the BIS interface to add an email account. 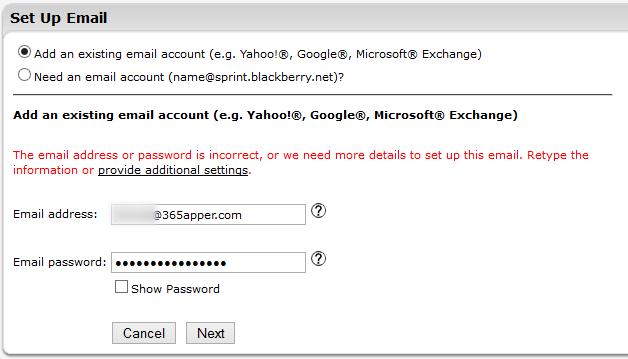 (The BIS interface must be manipulated to allow the account to be set up properly. Otherwise it will attempt to automatically add the account with the wrong settings.) First enter the email address into the email address field, and then enter an incorrect password into the password field and click Next. 4. Since the wrong password was entered for the account, the account wizard should fail and provide the following message: The email address or password is incorrect, or we need more details to set up this email. Retype the information or provide additional settings. Click the provide additional settings hyperlink. Email Address : Full email address used to login to the web access/portal. Email Password : Correct password for the account (clear the field and enter the correct password). Web Access URL : The URL obtained within the first step. Username : Full email address used to login to the web access/portal. Mailbox Name : Full email address used to login to the web access/portal. Click the Next button and, if all of the fields were entered correctly, a notification that the account was added successfully should appear. 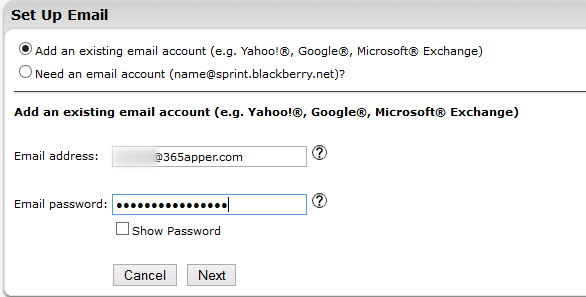 It will take about 5 to 10 minutes before mail starts to flow to the Blackberry device.